Spring is a time of fun floral prints and bright pops of color! It makes for a very fun season of fashion. Some special spring trends include floppy sun hats, and sweet-fitting dresses. This combination is perfect for a nice, warm afternoon at the beach. A spring staple piece you have got to have in your wardrobe is a striped clothing item of some sort. Stripes are big in the spring time whether it’s a striped dress or a striped top. If you’re looking to spice up a simple outfit, then wrap headbands are a nice touch to any outfit! The biggest spring essential has to be floral printed anything. When you think of spring you probably think of flowers in bloom so, why not have some cutesy flowers on something you’re wearing so your outfit can truly scream SPRING! Another fun spring fashion trend is to wear bright pops of color. The best part about this trend is that it doesn’t matter what what piece of clothing is popping but it will really set off an outfit. You could wear bright yellow shoes, shirts or shorts. The combinations are endless. The “mom” denim fit is very popular as well. 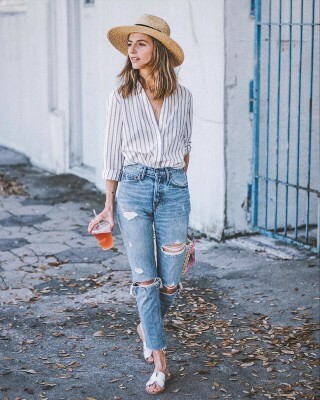 Mom jeans or shorts can really make an outfit. They give out a simplistic and easy-going kind of vibe. Last but not least, white shoes. White shoes can be worn with just about anything. You can wear them with a loose, flowey dress or with mom jeans and a t-shirt. These are just a few spring trends that you give a try, happy spring everyone!